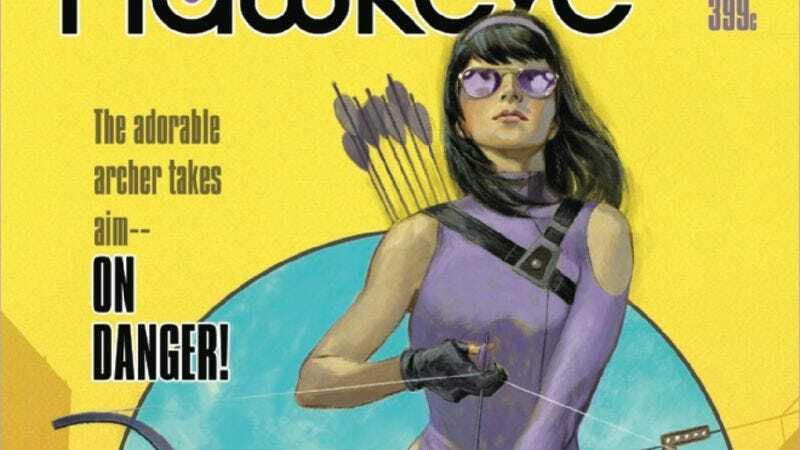 Kate Bishop proved that she could sustain her own series with her solo plot in Matt Fraction and Annie Wu’s Hawkeye issues, but readers have had to wait to see Kate at the center of an ongoing book. The wait is finally over with the new Hawkeye series debuting next week, and writer Kelly Thompson, artist Leonardo Romero, and colorist Jordie Bellaire are taking Kate back to familiar territory for the new title, planting her on the West Coast to fight crime in sunny California. For this first story, Thompson is taking a cue from the classic ’90s thriller Point Break as Kate finds herself up against surfer bank robbers in Venice Beach, and it’s a fun source of inspiration that emphasizes how this environment differs from Kate’s old New York City home. Romero and Bellaire have done stunning work together on assorted Dr. Strange issues this past year, and one of the most exciting things about Hawkeye is that it gives these two the opportunity to develop their creative relationship over an extended period of time. These preview pages of Hawkeye #1 feature bold graphic elements and a vivid palette perfect for the bright Venice Beach setting, and the detail in Romero’s linework is accentuated by Bellaire’s rich, textured colors. Romero has been growing dramatically with each new project, and the graceful linework and dramatic composition of these pages capture Kate Bishop’s effortless cool as she jumps into action.